While equity investors are focused on potential FICC disruption from the Brexit referendum on Thursday, secular headwinds to dealers are abating in interest-rate swaps or IRS, comprising ~80% of the global OTC derivatives market, as: (i) the compression of bid-ask spreads, of 50% since 2014 in US$ instruments, decelerates with the move to electronic trading, now accounting for 70% of volumes for standardized IRS versus 20% in 2012, nearing completion; (ii) dealer investments in technology allow them to match the response times to request-for-quotes of new entrants, such as Citadel, on electronic venues; and (iii) clearing innovations relieve some of the costs to end-users of the dealer-intermediated model including negative swap spreads, cross-clearing house spreads, and bid-ask spreads. Changes in the clearing framework for the repo market are particularly important since, as Citadel has commented, “the marginal cost of repo financing is driving the derivatives market and swap spreads in particular”. This marginal cost has risen as dealers respond to regulatory leverage requirements by re-pricing balance-sheet intensive products such as repo so that it can be more expensive to fund government bond than swap positions. This, in turn, has restricted supply of pay-fixed swaps increasing execution costs, prohibitively so in some cases, for natural receive-fixed participants including liability-driven investors such as corporates, pension plans, and insurers. Specifically, the balance-sheet costs of repo to dealers will be reduced by: (i) central clearing to allow the client and hedge legs of a trade in the matched book to be offset (not possible in a bilaterally-cleared model since regulators do not allow the netting of repo position with different counterparties); and (ii) intra-day settlement so that the expiring and replacement repo trade do not both count against the leverage ratio on roll-dates. LCH.Clearnet and CME are both working on repo clearing solutions that will play an important role in share-trends in the global market for swap clearing. Currently, these are driven by dealer use of pricing to shift volumes from CME, where clients can cross margining against Treasury and Eurodollar futures, to LCH where dealers have open interest on legacy OTC books. 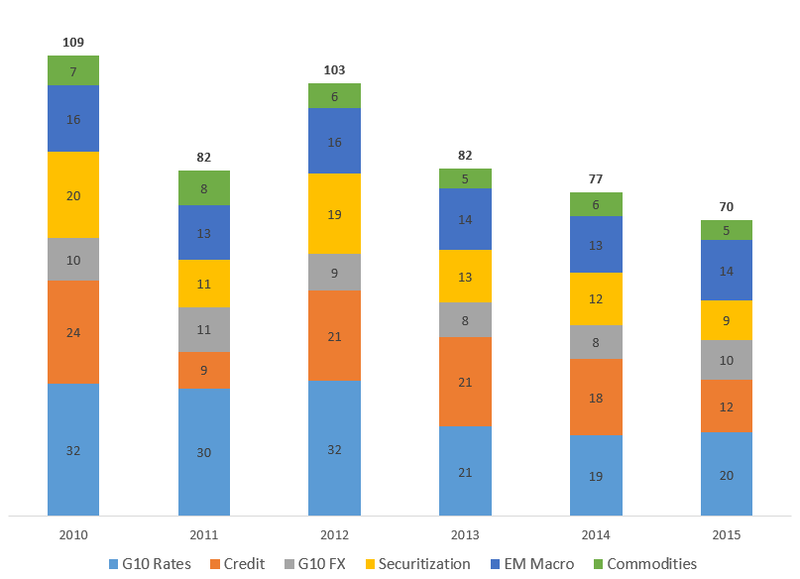 Over the last 5-years, the FICC global revenue pool has declined by over one-third to ~$70bn in 2015 with credit products down by over one-half and G10 rates products down by over one-third, and some offset from relative stability in G10 FX and EM Macro (see Chart 1). This decline exceeds capacity reductions, as measured by headcount which has fallen to just under 19,000 at end-2015 from ~28,000 at end-2010, suppressing profitability. This note argues that secular headwinds to dealers are now largely in the run-rate for G10 rates as the shift to electronic trading nears completion (with ~70% of standardized interest rate swaps or IRS traded electronically versus 20% in 2012) so that bid-ask spread compression, of 50% US$ IRS since the market-entry of Citadel in 2014, decelerates and as dealers make the technology investment in algorithms necessary to match the response-times of new entrants for requests-for-quotes (RFQ) on electronic “swap execution facility (SEF)” venues. The swap market involves natural demand from corporate issuers, pension funds, and insurers who receive-fixed to hedge liabilities and natural supply from hedge funds who pay-fixed against treasury positions financed in the repo market: these “swap-widener” positions act as a hedge against tail-risk since, in a risk-off environment, the swap spread, the difference between swap rates and comparable treasury yields, widens with a flight to treasuries from the bank instruments including swaps. Dealers intermediate the flows but, over the last year, these have been suppressed as regulation has restricted the supply of pay-fixed swaps. Corporate issuers, who typically receive-fixed in the swap market to hedge debt-issuance, are preferring to be outside fixed-rate tolerances because of the expense of hedging. To illustrate, a corporate can swap debt issued at T + 100bps (where T is for the treasury yield) to L + 90bps (where L is for the Libor rate) if the swap spread is positive 10bps but only to L + 110bps if swaps trade 10bps inside cash treasuries. LDI participants, such as pension funds and other liability-driven investors, typically receive-fixed in the swap market as a more capital-efficient way than buying corporate bonds to put on duration as a hedge against liabilities discounted at corporate bond rates. However, they tend to back away as volatility in swap spreads, a consequence of the reduction in swap supply and risk appetite, breaks the correlation between swap and liability discount rates. The economics of swap-wideners trades have also been squeezed by the fragmentation of swaps liquidity across central clearing counterparties, CCPs. The buy-side tends to clear at CME to cross-margin swaps with futures positions, particularly Treasury futures where CME has an effective monopoly and Eurodollar futures, while liquidity in the inter-dealer market is through SwapClear operated by LCH.Clearnet (majority owned by LSE). A dealer participating in the intermediation chain between a pay-fixed buy-side client and, ultimately, a received-fixed corporate client may therefore have to post initial margin twice – once on CME for the client-side leg of the trade and once on SwapClear for the hedge. Indeed, because of lower margin costs, dealers are quoting better rates for client swaps cleared at LCH with the “CCP basis” varying from 1-3bps since May 2015. The result is that buy-siders putting on swap-widener trades must either forego the cross-margining benefit of CME or the better execution of LCH; in practice, they have shifted volume from CME to LCH since May 2015 so that CME’s global market share of swaps clearing has declined sometimes quite sharply (e.g. to 30% in November 2015 from 38% in October) although CME indicates that it is gaining some intra-dealer liquidity from LCH as an offset to the loss of client liquidity. Buy-side Clearing: Basel regulations do not allow dealers to offset repos to different counterparties doubling-up the leverage impact of the matched book (where a dealer intermediate between a cash and securities lender in the repo market) relative to “buy-side clearing” where customer trades clear through a CCP and so can be netted. Intra-Day Settlement: The repo market is typically short-term, of 3-months, with repo financing rolled to fund longer-term positions. Given T+1 settlement, a dealer will have two unsettled trades both impacting the leverage ratio at the time of the roll: the expired repo and its overnight replacement. A move to intra-day settlement will remove the expired repo from the leverage calculation. Aside from the outright reduction in the balance-sheet costs to dealers of providing repo financing, these changes in the clearing framework will tend to stabilize the relationship between repo and libor rates reducing the risk of funding a term swap with a government bond financed in the repo market. Citadel has commented, for example, that “the marginal cost of repo financing is driving the derivatives market and swap spreads in particular … central clearing of repo is critical to changing this market dynamic. When we start clearing repo, spreads will correct significantly and variance will come down”. The attached appendix describes central clearing in more detail. There are three phases to a securities transaction: execution whereby the terms are agreed in a legally enforceable transaction either on an “exchange” or bilaterally in an “over-the-counter” or OTC transaction; clearing whereby the transaction is recorded by updating the accounts of the transacting parties; and settlement which involves the exchange of value under the terms of the transaction. The thrust of post-crisis regulation in FICC has been to force market participants to internalize the cost of risk-taking in derivatives activities through introducing standardized contracts for most OTC derivatives transactions (as opposed to exchange-traded derivatives or ETD, such as futures, which are already standardized) and requiring that these standardized OTC derivatives transactions be: (i) traded on exchanges referred to as swap execution facilities or SEFs; (ii) cleared through central-clearing counterparties or CCPs to guarantee the settlement obligations of the transacting firms to each other; (iii) reported to trade repositories or TRs; and (iv) subject to higher margin and capital requirements. 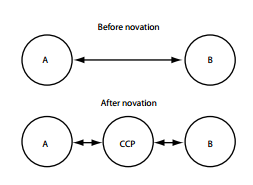 In a cleared transaction, a bilateral trade between two counterparties is replaced, in a process referred to as novation (Chart A1), by two symmetric, back-to-back trades between the CCP and counterparties with the CCP guaranteeing the settlement obligations of these parties to each other during the life of the trade. In FICC, these settlement obligations can be on-going for a long period of time given the existence of swaps with terms of 10-years or more. Firms can still transact bilaterally, and indeed cannot use a CCP for non-standardized OTC contracts, but non-cleared transactions are subject to higher margin and capital requirements largely because, as described in more detail below, they do not support multilateral netting. Regardless, the effect of higher margin, capital, and reporting requirements has been to meaningfully increase the costs of OTC derivatives. In 2014, Deloitte estimated the aggregate additional cost for OTC derivatives subject to central clearing at ~14bps of the notional amount outstanding at end-2012 of which ~70% was related to margin, 20% was related to higher capital charges, and the balance related to transaction-reporting cost; the estimate for the additional cost of transactions not subject to central clearing was ~170bps of which ~30% was margin-related and ~70% capital-related. The greater reliance on margin over capital for centrally-cleared derivatives is by design: margin is “defaulter-pay” in the sense of protecting the survivor using collateral provided by the defaulting counterparty to meet margin requirements, while capital is “survivor-pay” in the sense of absorbing losses using the resources of survivors; furthermore, margin is more targeted in that it is assessed against a portfolio of transactions that are eligible for margin-netting whereas capital adds loss-absorbency to the system more broadly. The heavier reliance on margin promotes the regulatory objective of forcing market participants to internalize the cost of risk-taking because of the need to post collateral, in the form of initial margin, when entering into a centrally-cleared derivatives transaction and to post variation margin to adjust the initial margin for day-to-day price movements. Initial and variation margin requirements are established by CCPs to protect against default by a clearing member before trade close-out and count both against the leverage ratio of banks subject to Basel 3 supervision and, along with trade exposure, against risk-based capital ratios. CCPs have a second layer of protection, beyond the collateral posted by clearing members, through a default fund to which clearing members commit to contribute in the event the CCP faces a shortfall because of default by another clearing member; default-fund obligations, even if committed and not yet funded, also count against leverage and risk-based capital ratios. The higher incremental costs of non-cleared transactions, estimated by Deloitte’s at more than 10x those of cleared transactions, have had the effect intended by regulators in driving market participants to use CCPs for OTC derivatives. The Financial Stability Board (FSB) estimated that cleared transactions represented 44% of the gross notional outstanding of ~$385tn interest rate swaps in September 2014 which, in turn, represent over 80% of the global market. The cleared portion was 56% of transactions for which CCPs were available meaning for the four broad classes of product (Chart 2) standardized by the European Securities and Markets Authority (ESMA), charged with implementing European Market Infrastructure Regulation (EMIR): fixed-to-float interest rate swaps (IRS); float-to-float (basis) swaps; forward rate agreements (FRA); and overnight index swaps (OIS). Central clearing accounted for 19% of $14tn gross notional outstanding of OTC credit derivatives representing 51% of the amount for which CCPs were available. Cleared transactions are less expensive than traditional bilateral transactions, where no CCP stands between the transacting firms, in terms of the costs of margin and capital because they allow for multilateral netting which can reduce the amount of counterparty risk both for each individual market participant and for the system as a whole. In Chart 3, the numbers on the arrows represent counterparty exposure as the replacement cost of a transaction – so, for example from the left panel representing a system of bilateral transactions, it would cost party D $5 to replace the transaction with party A – and the numbers within the circles represent maximum counterparty exposure – so, for example from the left panel, the maximum exposure of party C is $10 since it would need to replace transactions, each with replacement cost of $5, with parties A and D if both were to default. The right panel represents equivalent net exposures in a cleared system and illustrates that the aggregate maximum exposure across the four counterparties has fallen to $10 from $30 in the bilateral system and, indeed, that the maximum exposure has fallen for each and every counterparty.